In 1944-45, German V-2 missiles were launched from various sites to avoid Allied air attacks. The V-2 launch group had to be, therefore, highly mobile and capable of movement off the road. 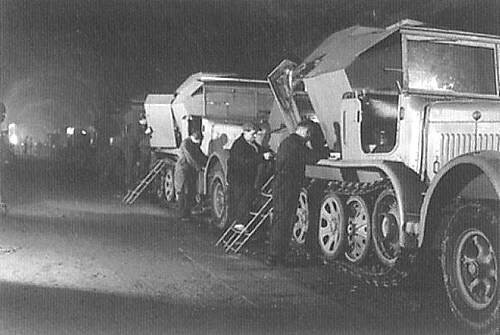 The firing of up to 8-12 missiles per day by some batteries showed the ruggedness in ingenuity of these units. 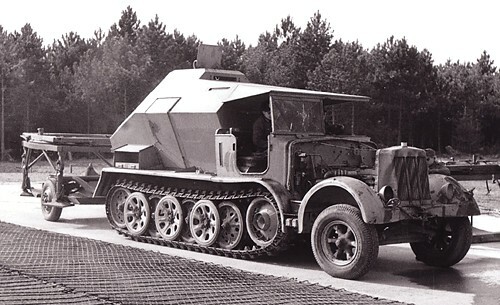 There were different types of specialized support vehicles in the V-2 launching units, such as fuel bowsers (Lw35019 and Lw35020 kits), generators, pumps, rocket trailers etc. 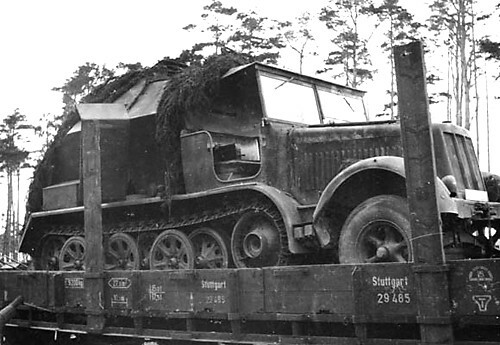 Some vehicles were adapted from existing Wehrmacht equipment and proved quite compatible. 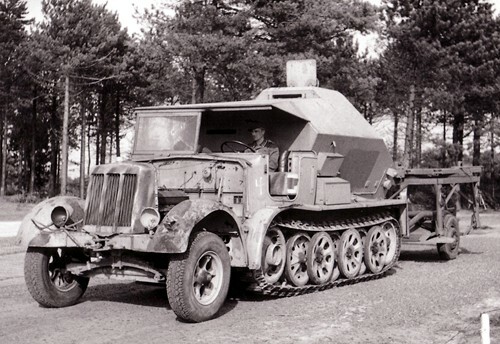 Thus, the very widely used in German army half-tracked prime-mover Sd.Kfz.7 made by Krauss-Maffei / Daimler-Benz and Bussing and powered by the 115 hp Maybach 'HL 52 TU' engine, converted to the armored launch control vehicle (the Sd.Kfz.7/3 Feuerleitpanzer), became the heart of the V-2 rocket launching units. 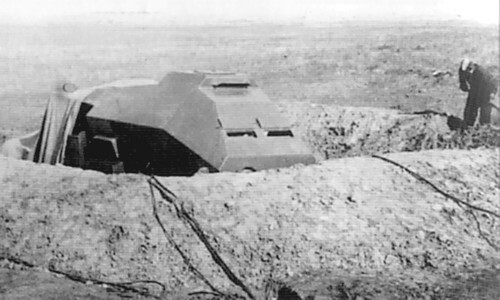 The vehicle, having an armored shelter superstructure, mounted on the rear of the half-track, would be positioned about 100 meters from the missile launch pad. The protective measures were intended to shield the crew in case the missile collapsed on the pad and exploded (not uncommon event with the early A-4). 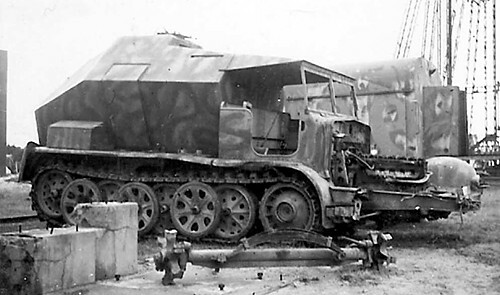 The photo below shows Feuerleitpanzer, captured by Russians, sheltered to perform the V-2 trials. 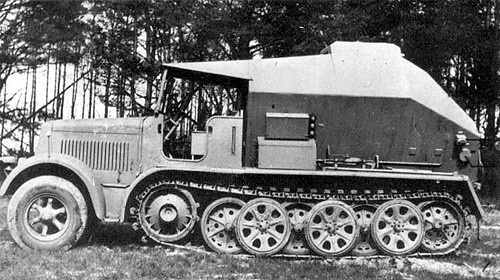 ( 1947, Kapustin Yar proving ground, Russia). Kleinen Klappenschrank zu 10 Ltg. 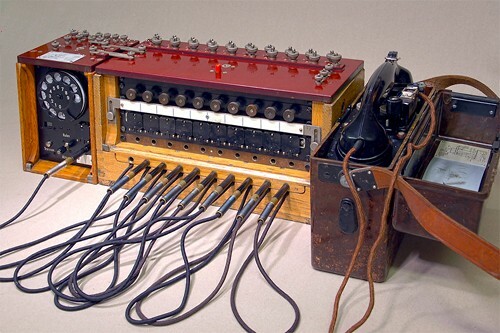 SB-10T mit Amtszusatz und Erdsprechgerat (the 10-lines Field Switchboards SB-10T with Dialing Device and Telephone Set). This set of commander's equipment is presented in the Lw35222 kit. 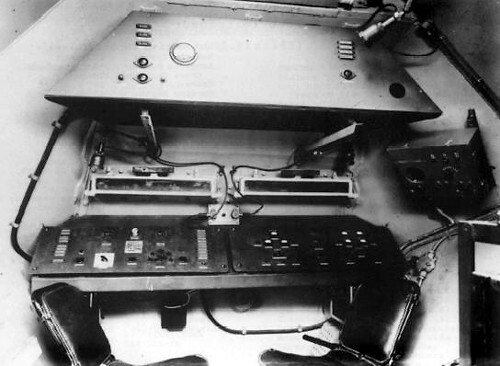 The telephone lines connectors were mounted on the port board, outside of the vehicle. 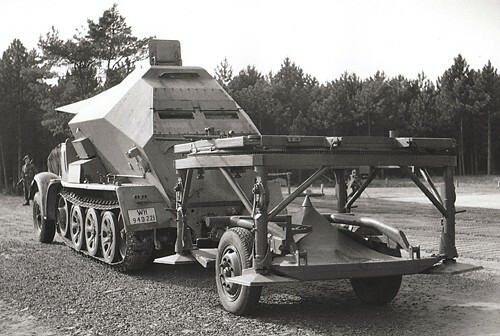 along with additional electric batteries, and the connectors to supply power and signal to the rocket. On the starboard side there was a door and a box for instruments and spare parts. 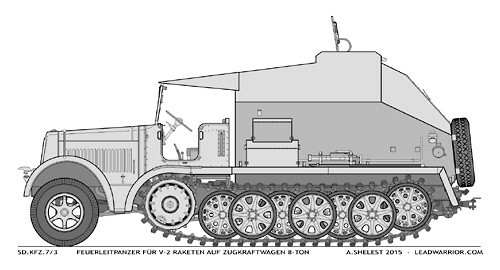 On the march, the Feuerleitpanzer often towed the mobile launching pad (Abschussplattform) on a trailer. 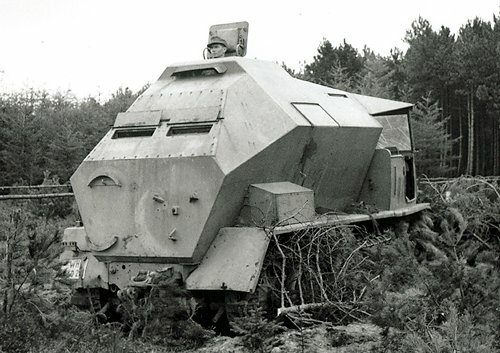 The Feuerleitpanzer model is available in two versions: as the Exterior-only Lw35223 kit, and the Full-Interior Lw35222 kit.